Neville is a Redguard knight and a retired Imperial Legion Soldier who respects Dark Elves and hates Nords. 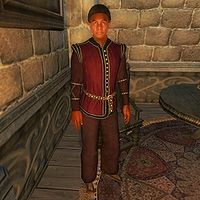 He is one of the people present at Summitmist Manor during the Dark Brotherhood quest Whodunit?. The chest in his room holds a full set of Imperial Legion armor along with a leveled mace; Neville holds the key to it. Neville wears a burgundy linen shirt, burgundy linens, and a pair of oiled linen shoes and carries a large amount of gold. Neville knows a leveled set of crusader spells. Neville claims to know all about Nords because during his youth he was stationed at Fort Frostmoth, and about the Dunmer because he spent time at Moonmoth Legion Fort. Neville: "So Nord, if you find the gold, what will you spend it on? Wait, let me guess, a sleazy whore and a nice new battleaxe. Am I right?" Nels: "I'm going to open a tavern. Not that I'd welcome your patronage. No pigs allowed inside you see. You Legion types tend to stink up a place." Neville: "A Tavern? Ha-ha-ha-ha-ha! Oh, I should have known! Leave it to a barbarian to spend an entire chest full of gold on beer and mead. How pathetic." Nels: "You can call me a barbarian. It's true and I'm proud of the fact. But you call me pathetic again and I'm going to show you just how barbaric I am." Neville: "With every word you speak you're just proving me right, Nord. Your kind has contributed nothing to our Empire and never will!" Nels: "Ha-ha-ha-ha-ha! "My kind," as you like to call us are plenty happy serving our own needs while your useless Empire crumbles down around you." Neville: "Your words border on treason, Nord, and I will not tolerate them! You will respect the Empire! You will respect the memory of our dear Emperor!" Nels: "Bah! Don't get your linens in a bunch! You have no authority in this house, or anywhere else! You're not even in the Legion anymore!" Neville: "Nevertheless, I still serve the Empire in my heart and will not abide such talk! Walk away from me now, barbarian, or you'll regret your arrogance!" Nels: "Pfft. I was done with you anyway. I can only talk to an Ex-Legion pig for so long before my ears start bleeding. Besides, I need a drink! Ha-ha-ha." Due to his high aggression, it's likely for him to attack you on sight when entering the Manor if your infamy is high enough; this can be used as an advantage however: since he is the attacker, the other guests will help you kill him and you will not gain a bounty for being attacked first. Esta página foi modificada pela última vez à(s) 18h53min de 9 de dezembro de 2014.